【Safe & Durable】The egg cooker is made of food grade silicone and high-quality PP material, BPA-free. These cooking egg cups are enough to ensure food safety. 【Convenient & Practical】Just crack the eggs and pour into a cooking cup, 4-6 minutes to boil from soft to medium and up to 14 minutes for boiling. Heat quickly to save time and no longer bear the pain of removing eggshell! 【Multifunction Cooking】Egg cooker set includes 6 Pieces egg cooker and a splitter that separates egg white from the yolk.Easy to make soft or hard boiled eggs, mini omelettes, Eggs Benedict, poached egg and more.Create multiple dishes, enjoy your life! 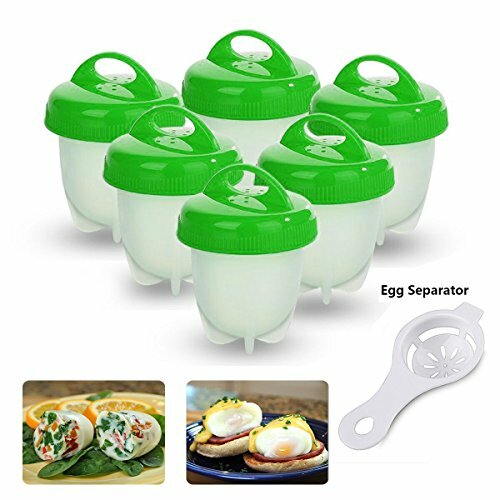 【Easy to Clean】These non-stick silicone egg cooking cups easy to clean and detachable. And can use the dishwasher for washing. Not require a lot of work to thoroughly clean them, save time. 【Not Just Kitchen】6 * boiled egg cups can provide you with a wealth of nutrition and protein substances. Small and portable, suitable for different occasions. In picnics or parties, can demonstrate their capability fully. A must for any kitchen.